Those words were spoken to Judge Brett Kavanaugh, loudly, by Sen. Lindsey Graham during a cold day in the Senate on Thursday. No it’s not hell, Senator. Christine Blasey Ford had a better “hell” story to tell than the judge did. Not being promoted to the United States Supreme Court is a far cry from hell. If he is not confirmed, he will simply go back to the powerful D.C. Circuit Court of Appeals for as long as he likes. That too is a lifetime appointment and one he already has. Without him on the Supreme Court, how will our nation endure? Much like it did before is the answer. Kavanaugh is just not that important. There are others available to do the job for which he is interviewing. President Trump has a list of potential candidates who are qualified, capable and conservative. I’m not excited about any of those other options either. But President Trump won the 2016 election and the senate is currently controlled by those who find that list attractive. The GOP spent way too much on this nominee, no matter what they ultimately decide. They have fought for him as if he is the last man available for the job. And women voters across America are watching. How unimportant is Kavanaugh? There are five members of the nine member court who are Ivy League men now. Republicans seem to need six. Kavanaugh wasn’t victimized here. 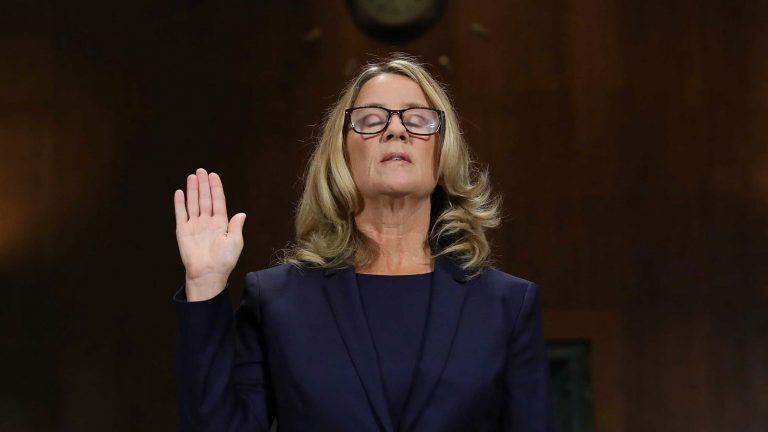 Dr. Ford was. Here are some of the reasons. First, he is a part of this process voluntarily. He “entered the arena.” He wants this job bad enough to put his family through a fight over sexual assault allegations that will never be disproven. He wants it more than I think anyone should. Republicans also want it to be him way more than anyone should. When Justice Anthony Kennedy retired, our government became charged with filling “it.” “It” is the vacant seat on the court. What most Americans don’t know about “it” is that there are almost no required, specific qualifications for the appointment. A justice doesn’t even have to be an attorney–look it up. Therefore, the most important part of the decision the senate faces in its role to “advise and consent,” is the evaluation of the nominee’s character. When evaluating anyone’s character, what are the standards? I have my standards–and Dr. Ford’s testimony disqualified Kavanaugh because of them. But what are Sen. Ben Sasse’s or Sen. Kamala Harris’? Governing is choosing, and judging someone’s character is subjective. Politics is struggling with what government is charged with this time. A reason for that is that lifetime appointments are unique in our system. This 53 year-old man will never run for reelection. Our nation should expect that if confirmed he will be a member of our highest court for thirty years or more. The court has always had an air of supremeness, and not entirely because of its name. In royalty, only death separates the human from the crown. In the last thousand years, only five popes of the Catholic Church have resigned or retired. None of that is actually democratic either. A Kavanaugh-type confirmation process actually was contemplated by our nation’s founders. It is a process designed specifically not to remove or eliminate politics from one’s character, but to end politics once the justice has been confirmed. I think Kavanaugh showed in the Thursday hearing that politics will never leave him. He blamed Democrats, and bizarrely even the Clintons, for the alleged “con” that brought the airing of this final issue. Regardless of who anyone believes in this showdown staged by 85 year-old Chairman Chuck Grassley, this nominee’s indignant words and behavior toward the committee concern me about his judicial temperament. Even if one believes his blanket denials, his partisan tantrums in the hearing are a valuable tell. He seems so angered and scarred by what he believes to be an unfair character assassination, he may not regain his composure. I believe Dr. Ford, and because I do, I thought the GOP should have found another nominee. Suspicion of lying to congress and a potential sexual assault charge in Maryland is a lot of baggage for a new hire. The GOP could do better than this guy. It should take a cold day in hell for the senate to confirm someone like this. As cold as Thursday was, it still could get colder.